The Crystals and Chain Bracelet is an exciting design that combines beading techiques with chain mail. It can be made in two different sizes, large or small. 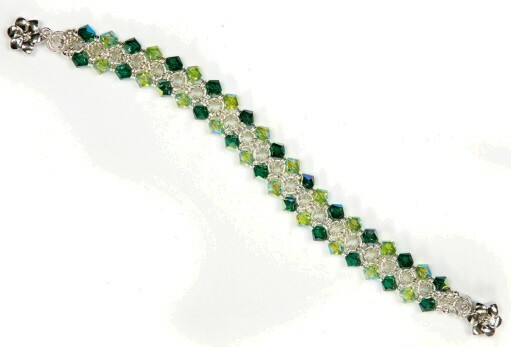 The large bracelet utilizes 6mm crystals with jump rings that coordinate to their size. The small bracelet utilizes 4mm crystals with the appropriately corresponding sized jump rings. You add the crystals to the kit so that you can pick your favorite color(s). This is a beginner chain mail weave. The clasp is not included in the kit.